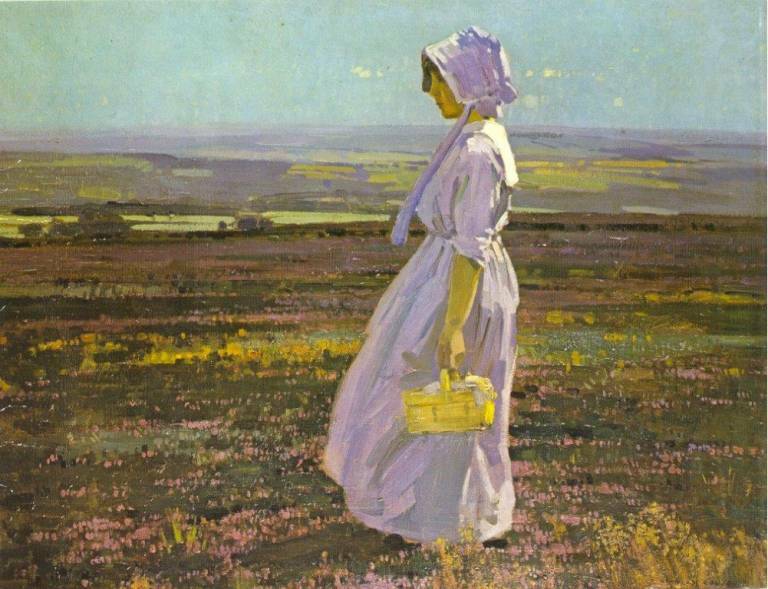 ‘Morning on the Derbyshire Moors’ is, I would imagine, Stanley Royle’s most familiar image. I use the word image advisedly. It reproduces so well it is a popular greetings card, for example. As a striking and immediate painting it featured in Sheffield’s Weston Park Museum redevelopment when a group of works were chosen to provide an ‘introduction to art’. Its simplicity and beauty were, no doubt, reasons for it being chosen for a card and an introductory display. As a clear, legible image, it shows a pretty young woman on a bright sunlit moor. She is looking sideways, away from the light. The dabs of colour on the greens in the foreground suggest spring heathers. The composition is simple, with the girl aligned on the ‘golden section’, across a single horizontal line. As the label in the Sheffield introductory display explained, the hues in the image are a beautifully considered set of primary and secondary colour relationships. This accords with Royle’s own description of his working method. “My first consideration, in painting the finished picture, is design. Everything really depends on this first planning of the basic rhythms”. Many of his paintings can be compared in terms of design and composition across different subjects. A relatively high horizon is underscored by a highlighted parallel line, whilst a point on the golden section is picked out either by a motif which generates a linear edge – a bridge, a building, a tree – or a strong vertical subject or gesture. ‘Morning on the Derbyshire Moors’ recalls another work by Royle from 1913, some seven years earlier. 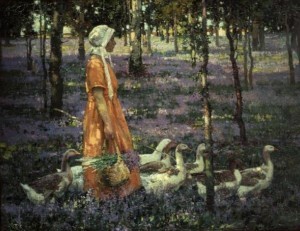 Here, in a reversal of the composition, a young woman gathers bluebells in the woods. Trees form a frieze as a backdrop, with horizontals hinted at by nuances of tone as a compositional framework. It also anticipates ‘The Goose Girl’, in the National gallery of Ireland, the painting which was re-attributed to Royle having been described for many years as being by William Leech. Who is this woman? At this point in a discussion of these works, especially ‘Morning on the Derbyshire Moors’, such a question offers a choice. We can see her as a type, or as a specific individual. If we take the first option, she is an example of a characteristic feature of contemporary painting in the last quarter of the 19th century and the first quarter of the 20th. No doubt prompted by Monet and Renoir’s definitive images of women in the landscape, two generations of artists in Britain and Ireland used a sideways view of a young girl as both subject and compositional motif. The mis-attribution of ‘Goose Girl’ in part reflects the generic and generational nature of the work. If we take the second option, and examine the dates, we can speculate that this woman is a specific person. The most obvious candidate is Stanley’s wife, Lily. If we take this route, the true potential pathos and power of ‘Morning on the Derbyshire Moors’ becomes evident. Stanley met his wife to be in around 1913. The girl in the bluebell woods – which could, for example, be Ecclesall Woods in Sheffield’s south-west, near where Stanley lived – becomes a delicate evocation of romantic encounter, albeit couched in the post-Impressionist idioms of the day. In 1915 the couple had become parents to a baby girl. In the period immediately after her birth, Lily became prey to what we would now term post-natal depression. At that time, severe cases led to extended periods of residence in mental hospitals such as Sheffield’s Lodge Moor. This indeed was what happened to her. High on the moors to the west of the city, patients could be taken for walks on to the open spaces surrounding it. This liberating experience can still be sensed today in the locality despite the growth of suburban housing. So, far from being a simple formulaic image, ‘Morning on the Derbyshire Moors’ becomes subtle and layered. It is a moving statement of the persistence of love within a complex relationship fraught with difficulty and anxiety. It expresses the potential for the experience of the landscape to be healing, and places the subject, even whilst shadowed, in the light.